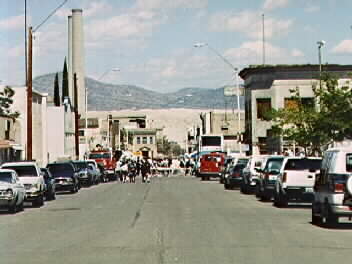 This is a view of the main street in Miami, Arizona. Miami was founded in 1907, and most of the buildings in this photo date back to Miami's early "boom days" of the first decades of the 20th century. 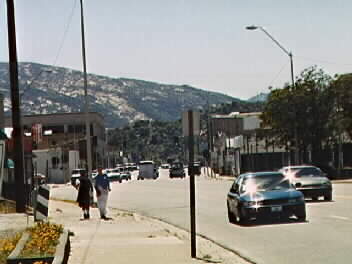 This is a view of the "other" main street of Miami: Sullivan Street. On this day (April 1997) Miami was celebrating "Boom Town Days," in which citizens participate in contests, games, etc., that hearken back to the exciting boom-town times. This is a view of the town of Miami from one of the hills south of town. 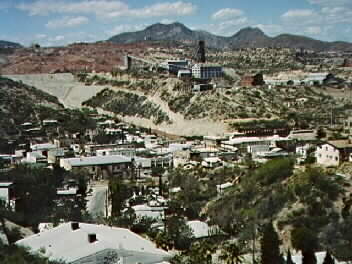 Much of the mine works in this photo are no longer in operation, dating back to the World War II era, but west of Miami there is a huge open-pit copper mine (owned by Cyprus Miami Mining Corporation, successor to the Inspiration Consolidated Copper Company) that is still very much productive. Sleeping Beauty Mountain can be seen in the background.